“WHY WAS THE ZIONIST JEW Philip Zelikow appointed as Executive Director of the 9/11 Commission?” many are now asking. Indeed, many are saying that Zelikow, with his close ties to Condoleezza Rice, Cheney, & President George Bush, could not conduct an unbiased investigation as Director of the Commission. The Family Steering Committee for the 9-11 Commission repeatedly called for Philip Zelikow’s resignation. The families, citing Zelikow’s close connections to the Bush Administration, were concerned that Zelikow’s appointment made a mockery of the idea that the Commission was “independent.” But the Zionist controlled Bush Administration ignored their complaint. 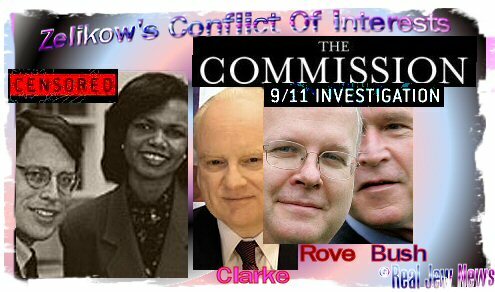 2004: Zelikow is secretly in contact with President Bush’s close adviser Karl Rove while the “independent” Commission is completing its report finalized on July 22 2004. I Recommend That The 9/11 Investigation Be Reopened! And That No Zionist Jews Be Involved! thank you so much brother! I pray for your safety and good health. keep up the good work and the dispensation of much needed truths. I am sending a check via snail mail. Paypal seems a bit contrary to my input. What was in building 7 anyway? I bet the report didn’t cover CIA training the same type of people Islamic merceneries that brought down the towers. SDA founder, one of the CIA’s proxy militia in the Balkans transfered money to the 9/11 hijackers http://www.slobodan-milosevic.org/news/ftv-da050908.htm. James, do you really still believe that an Arab, last reported dying of kidney failure in a Mid-East hospital, nipped ovet to a cave in Afghan. and shut down the half trillion dollar US air defenses with his laptop? Or are you part of the disinformation brigade I think the latter. Great article, more truth comes out all the time. Itâ€™s just a matter of time until the hole truth about 9/11 busts wide open, and you remember that old unwritten law. What ever goâ€™s around comes around. Itâ€™s starting to work. Good OLE Ted Kennedy had a malignant brain tumor cut out of his head, but I believe Itâ€™s just going to prolong his death. Tim Russert dropped dead with a heart attack. When people do bad things to other people that law always holds true, if it doesnâ€™t cast sentence in this life, I bet their sentenced straight to Hell. 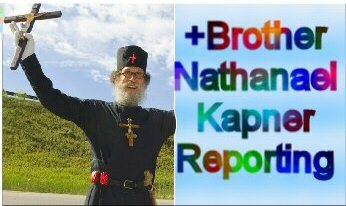 Keep up the truth Brother Nathanael, keep up the scare. Do you know what was in building 7? Everybody talks about its staged collapse but no one has ever mentioned what was actually in it. If we knew what was in it that would reveal something new about 9/11 and why it had to be taken down. Its obvious 9/11 was done by Mossad to attack Iraq, it was a jewish scientist that mailed the anthrax letters to convince Iraq was a threat. it is funny how anthrax letters were posted to senior jewish broadcasters in the US were accompanied with instructions how to seek immediate medical attention if contaminated. The many Catholics that frequent this site won’t like this one bit, but it might prove to be interesting food for discussion. there’s some truth to that and it is suspicious that there was one plane that didn’t reach its target and yet the number of buildings that ‘fell’ equalled the number of planes that were supposedly ‘hijacked’- all those preplanted explosives in building 7 and no kamakazie plane…what! …not to mention the insurance payout….10 years in the planning - and they still stuff up. James just to correct you, THere were NO SUCH Islamic merrceneries theat brought down the towrers!!! HAve u not watched all the overwhelming evidence as to 9-11 and the towers?? ?Surelyu havent , if oyu had watched all the evidence then u wudnt be here making false comments and remarks. Pls do urseslf a favour and start studying the ral facts. It was the Bombs that were placed in the Towers by the Amercian Government/ Zionists that brought down the Towers!! Do you not think it was islamic merceneries that hijacked the airliners? It was islamic merceneries that mossad recruited from camps by supposed islamic convert to Judaism Adam Gadansk ( whos grandfather has links to the ADL whom he was staying with) in Afghanistan thats why they were never arrested once they came into the US. Nick Berg was Muhammed Attas handler and according to main stream press Atta even had access to his laptop. All of the hijackers that were confirmed to be on the hijacked flights have links to theatres of combat where the CIA benefits and supports as well as subsequent terror attacks since 9/11. You do have the Urban moving spy ring and the five dancing Israelis but there is no concrete proof that would be reliable in court that the towers were brought down by an explosion as there has not been any forensic tests to prove this. But there is real proof of financial paper trail evidence linked to NGO front organisations specifically those financied by Abdullah Bin Laden. Investigative journalist Greg Palast obtained and shows an FBI document that states that the White House orders a stop to FBI investigating Abdullah Bin Laden months prior to 9/11. Why? The links you provided have many historical inaccuracies. The Rockefellers owe their initial financing to the Rothschilds. I won’t even start dissecting all the errors in there. It’s author, Marshall Douglas Smith makes many claims that are untrue. He seems to make the dubious claim that the Rockefellers are rulers of this planet, when they are actually mere servents of a bigger master. Eustace Mullins is much mroe knowledgeable in the history of the Rockefellers. After much research, I’ve also concluded that the Rotschilds have masters of their own. They were propted and helped along the way by a sort of consortium of Jewish merchants who controlled interests in finance and especially, the East India Company. I always assumed that the Rotschild’s lending power grew from a support of wealthy merchants and not magically of their own doing. The 9/11 COVER-UP MAN - ZIONIST ZELIKOW -certainly didn’t want people to know that Netanyahu, Bush Sr, and one of the Ford’s helped to plan the 9/11 attack in 1984. Can you imagine what the American people would think about the State of Israel, the Bush Family, and Ford Motor Company. How many Ford’s do you think would be sold if all of this sunk in our teeny little brain. If you really want to know who planned 9/11 read the following. This was on Prison Planet a few years ago. Al-Bana: This is a book written by Benjamin Netanyahu on the uprooting of terrorism. He talks about attacking the Twin Towers, He talks about attacking the US National Security Council, and about attacking the UN. Take, for example, the Twin Towers operation. Such an operation doesn’t require placing a car bomb under the two towers but placing small nuclear bombs and detonating them. The scenarios were ready. This scenario was prepared by the Jews at the Jonathan Institute. Interviewer: What scenario are you talking about? Dr. Hasan Al-Bana: The scenario of bombing (the WTC). I’m talking now about the bombing scenario and how it was a planned operation, and not an act of revenge. He had to find an excuse; a reason for intervention. Interviewer: Dr. Hasan, you talk of the perpetrator. Are you saying there was an Israeli plan ready for operation? Dr/ Hasan Al-Bana: The scenario was prepared by Israel and the US. (The Jonathan Institute) is situated in Jerusalem and it has branches all over the world, When he talks about scenarios of destroying the US from within, to drag the US to fight what has been known worldwide as “terrorism” - this isn’t a passing event. It is a practice that has accompanied the Jewish existence throughout the world. They became allies with the Romans against the Persians and when they were taken into captivity in the Babylonian exile, they became allies with any power that arose. They became allies with the Muslim nation, at a one point. Later on, in Europe, they became allies with Britain and came to the region, to the State of Israel. After all this they became allies with the US. Henry Ford and George Bush attended the Jonathan Conference in 1984. They agreed with Netanyahu on the scenario for the bombing of the Twin Towers. When Netanyahu was asked how a force can be mobilized… He said: “In America you have religious factions who oppose abortions in hospitals. This religious sentiment can be exploited and channeled into these kinds of operations.” This all exists (in writing). Anybody who read Uprooting Terrorism (sic.) and many other American books (would understand). Moreover, there is no such thing as a conspiracy. What conspiracy? George Bush Sr. and George Bush Jr. are the only American presidents to control the CIA. George Bush Jr. declared that the Twin Towers operation would remain completely secret. Yes Zionist Zelikow helped to cover all of this, and much more up. He was protecting his Zionist friends who are Terrorist’s, and Mass Murderer’s! Who said that the Rockefeller’s aren’t Jewish? Born in 1915 and youngest son of John D. Rockefeller, Jr. Descendant of the German-Jewish Roggenfelder family which came to the United States in 1722. Thank you for exposing Osama bin Laden as a dupe for the Jews. When bin Laden said that HE was responsible for the 9-11 attack, he was covering up for the Zionists who were REALLY responsible. We need to hear more details about this plot. Now we have zero facts, but we already know the truth without any facts. Every ill and every crime in our country can ultimately be traced back to a Jew. we are suffering from isreal, we see that most chritians outside palestine are helping isreal killing us..why. the only defense we have is our muslim palestinians who stand with us..
An interesting site with interesting discussion. I want to point out a large, missing chunk of historical fact that is relevant to the events of 911, that is the relationship developed and honed/groomed between Zionists, organized crime and politicians. This was most prevalent in Minnesota, led by Hubert Humphrey, who was closely aligned with Meyer Lansky’s “Kosher Nostra”, the Zionist movement (he was reportedly more of a Zionist than most Jews), and powerful corporate interests on Wall Street, with Cargill, and with Carnegie Steel. Lansky and Bugsy Siegel gave heavily to the Zionist cause, with more money for their corporate enterprises centered here than Miami Beach - where the current Godfather, Alvin Malnik, resides. Malnik’s attorney, Washington power broker Richard Ben-Veniste was also on the Kean Committee investigating 911, so those truly responsible for the 911 attacks had cover from more than just Zelikow. Malnik has ties to both Israel AND the Saudi Royal Family - his son married King Abdullah’s daughter and father/son (Jews) converted to Islam. Funds paying for 911 were traced back to the Saudi Royals (not Bin Laden) but Mr. Ben-Veniste squelched those inquiries as the lawyer for the the Saudi’s and the Kosher Nostra. This all crystallized, or appears to have crystallized into a coherent group effort when GHWB and other intelligence operatives from around the globe set up the Safari Club and the BCCI network. Bin Laden’s case worker led the Saudi faction of this group, which has undermined counterintelligence capabilities around the globe in the name of looting, plundering and de-populating parts of the planet with resources they want to get their mitts on. For those who doubt whether or not our government was aware of and involved in the 911 attacks, I’d point you to read about Sibel Edmonds, the Turkish born US citizen who translated intelligence documents after 911 and found funding routes within the US. I personally identified, mapped and turned over a major funding network called a “corporate cascade” that was established for use in laundering money for covert operations. This was being done by establishing exotic animal “sanctuaries” - places that claim to save endangered species. There is no oversight, no paperwork requirement, the public is ignorant of the fact that tigers breed like housecats in captivity and so are NOT endangered outside of native habitats….and they’re worth less than $200.00. A cockapoodle costs more than a tiger. Still, the money laundering capabilities are vast and the CIA’s drug/weapons ops need to be able to clean the cash. I identified BAE defense contractors, Lockheed Martin defense contractors, Northrupp Grumman contractors, ex-FBI agents, current FBI agents, and two high ranking CIA officials among this dirty crew. Colonel Terry Markham, CIA Langley hired defense contractor David Conway as an agent of compromise when I initially began looking at this because he knew me. General Michael Ennis became Director of HUMINT in 2004 and is listed as a “reference” for renewal of Conway’s security clearance. Conway received training at Offutt, which is where Warren Buffett held a fundraiser on 9/11 - with George HW Bush in attendance after having flown from Minnesota with the head of Milwaukees Secret Service detail, John Berglund. While there is a great deal of vague talk about funding for 911 by authors like Joe Trento, and the 911 Commission considered following the funding trail “irrelevant”, the fact is that we identified a major funding source that had HQ in Washington DC and tentacles into South Africa and Guam, and the Department of Justice, working with the state of Minnesota, the FBI, NSA, CIA, and Dept. of the Interior, is covering it up. Evidence (iepaperwork left during an interrupted break-in) links the operation to Daniel Vesco, son of Robert Vesco. It also links to Cali cocaine money laundered through shells set up by individuals associated with Rampart Securities - sort of prosecuted but not really, during Operation Bermuda Short. Again, the FBI, is aware of all the threads, links, and tentacles to Israel’s Mossad, Saudi’s GID, Pakistan’s ISI, our own CIA and organized crime……and they are running the other direction. 911 was an inside/outside job,organized by the shadow government within our government. BTW: The FBI was recently notified about 450+ yards of 60″ wide desert camo fabric purchased by a group of Saudi men who payed cash in Rochester, MN. They were unconcerned. Zelikew in 2002 claimed that the Iraq war was largely for Israel’s security. I can’t Believe you Americans. Your Country has been Hijacked. Your Forefathers & -Mothers must be majorly ticked!